In February 2019, the Principles for Responsible Investing (PRI) initiative, announced it will make several of its climate risk indicators mandatory for PRI signatories. PRI requires signatories to annually report various environmental, social, and governance (ESG) metrics via the PRI reporting tool. In 2018, the PRI introduced TCFD-aligned indicators to its Reporting Framework, including reporting on four indicators of climate risks: governance, strategy, risk management, and metrics and targets. Until now, this reporting has been voluntary and disclose. Which indicators will be mandatory? SG 13 CC: outline how strategic risks and opportunities are analysed. PRI currently has over 2,300 signatories, includingasset owners, investment managers, and service providers that collectively manage over $83 trillion in assets. This change in their reporting framework will greatly increase the amount of climate-related reporting within in its framework by signatories. This move also indicates the direction of travel regarding reporting on climate risks: the PRI has indicated that the remaining PRI climate risk indicators will stay voluntary with a view to becoming mandatory as good practice develops. The climate change indicators of the overall Reporting Framework can be found here [pdf]. The PRI is a non-profit independent organisation that works to understand the investment implications of environmental, social and governance (ESG) factors. The PRI supports its international network of investor signatories in incorporating these factors into their investment and ownership decisions. The organisation acts in the long-term interests of its signatories, of the financial markets and economies in which they operate and ultimately of the environment and society as a whole. Charts produced by Tom Prater for Carbon Brief using Flourish and Tableau with OECD data. This article was originally published on Carbon Brief and is shared under a Creative Commons license. The adaptation finance roundtable focused on how developing countries can mobilise investment for climate adaptation more effectively. The discussions explored a key question: ‘Who benefits from investments to reduce climate risk and, as a result, who is willing to pay? Indeed, ‘who benefits’ is a question that gets to the heart of individual and organisational incentives to invest in climate change adaptation. Convincing businesses to pay for climate adaptation depends on aligning identified risks (and mitigating measures) with their business plans. The group considered the hypothetical case of a 5 star hotel on a stretch of coastline, where mangroves protect against coastal erosion. Imagine how important the mangroves’ ‘green infrastructure’ could be in breaking up wave energy and retaining soils as storm surges increasingly pound the coast in a changing climate. The hotel’s very existence depends on the shoreline’s integrity and the presence of mangroves. The hotel company would benefit directly and materially from preserving the mangroves. There is a clear business case for why the company should invest in mangrove conservation to protect its own continuity. Here, investing in mangrove protection, a form of climate risk reduction, becomes an integral part of the business plan. In this scenario, it is likely that conserving the mangroves would benefit the local community and wider society, by providing many ecosystem services (some with direct monetary value, others not), such as hatching grounds for fish, carbon storage and sequestration, and so on. These would be ‘positive externalities’ of the company’s investment, that would bolster broader social resilience. Consider another case: the 5 star hotel is positioned several kilometres inland. Removing the mangroves has no immediate impact on the hotel’s physical integrity and its profitability over five, ten, even twenty years. Imagine in this scenario that thousands of low income residents are situated close to the mangrove forest and highly exposed to coastal storm surges if the mangroves are cut. Some community members gain from cutting the mangroves today for their firewood and income needs, but overall, these gains are small and short-lived; whereas a mangrove conservation scheme promises steadier long term employment for some workers and indirect benefit from healthy fisheries and a resilient, more protective coastal environment, for thousands more people. In this scenario, the hotel company doesn’t have a business case for investing in the mangrove’s protection; it has less stake in the game. By contrast, thousands of community members have a material, long-term stake in the mangroves’ health. Here, the needed investment in mangrove conservation (and hence climate risk reduction) is a public good. Who invests? Who is willing to pay? The hotel company may be willing to pay, but as a matter of corporate social responsibility or ‘charitable work’ rather than as an integral part of its business operation. The community members may band together to self-organise and pay in cash or in kind for mangrove conservation. Or, this could be a role for financing by local or national government (or benevolent, external actors) of this public good. Sometimes the investments that companies need to make to reduce their climate exposure and vulnerability are clear-cut. Other times, it takes big picture thinking and good data and analysis to pinpoint the investments that will reduce climate risks to a manageable level. 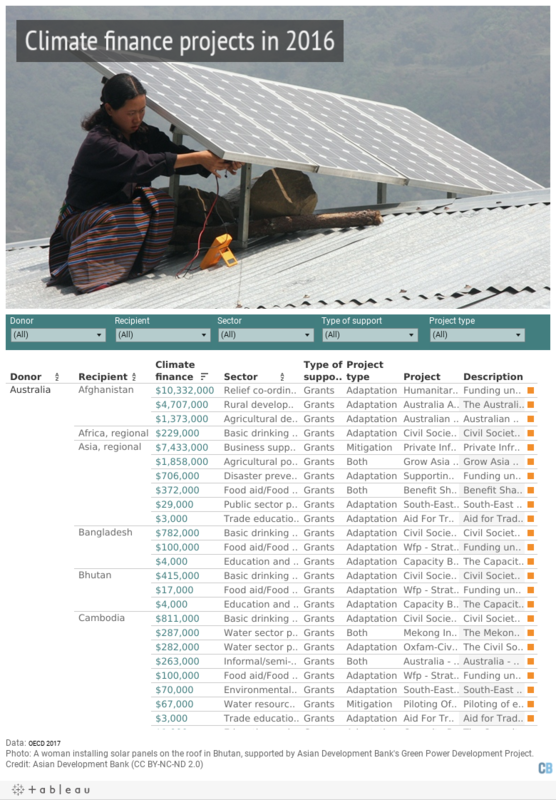 The Oasis Platform for Catastrophe and Climate Change Risk Assessment and Adaptation – which is funded by the CPI’s Global Innovation Lab for Climate Finance, offers ‘a set of tools that together aim to offer a more transparent, robust and comprehensive approach for analysing and pricing risk from extreme events’ including modelling of climate-related disaster losses. Dickie Whitaker, its Chief Executive, said: “We are looking at mangrove swamp removal and coral reefs and the connection is embedded in the model-as well as factors such as the type of soil, the saturation of soil, and the runoff. We don’t say ‘I wonder what will happen to the mangrove swamps because it’s included in the model already – if someone takes the mangroves away, then the insurability will go down”. Craig Davies of the EBRD pointed out that recent developments such as the Task Force on Climate-related Financial Disclosures (TCFD) are beginning to create incentives for a more rational allocation of capital in a way that reflects the realities of climate change impacts. Multilateral finance institutions and climate finance mechanisms should urgently consider how the public funds that they manage can help ensure that developing countries are not left behind. ‘International climate finance has an important counter-cyclical role in supporting vulnerable locations and communities that commercial finance would otherwise not reach’ said Dr Davies. Forms of blended finance, where the public sector takes the ‘first loss’ for an adaptation investment and reduces financial risk for private investors, are growing in popularity – a recent article by Charlotte Ellis and Kamleshan Pillay documents promising blended finance initiatives in Southern Africa. Ultimately – according to John Ward, Director of Pengwern Associates, the public sector may have a role to play in monetising and paying for the benefits of resilience activities that are not currently monetised and paid for. These interventions to build climate resilient societies – beyond the company level – could be as fundamental and diverse as: data and information sharing, creating education and alert systems, creating, preserving or restoring public infrastructure and many other activities. Roundtable participants agreed that non-governmental organisations have often led the field in identifying the multiple benefits of adaptation projects and either financing them directly from their own private sources, or setting up reciprocal financing mechanisms to make programmes self-sustaining. Many successful NGO initiatives involve nature-based solutions that mediate the impacts of climate change—such as tree-planting and sustainable water management in watersheds to benefit both upstream and downstream water users and compensate natural resource managers for their efforts. One such combined initiative on climate adaptation and mitigation, by the NGO Natura Bolivia in Santa Cruz Department of Bolivia, has now grown exponentially in size and is being adopted across many other parts of Bolivia and South America. One thing is for certain: experts at the roundtable agreed that identifying climate risks, who has a stake in managing the risks and who’s willing to pay – plus the job of unlocking that finance – is a process that generally takes too long. Climate risks are here today and action is needed now. Without action to reduce climate-related risks, losses for firms and for societies will mount – with UNEP predicting an annual cost of climate adaptation in developing countries of up to US$500 billion per annum by 2050. *The policy roundtable took place under Chatham House rules and all interviewees agreed to be quoted for this article. Further results of the study will be published on www.climatepolicyinitiative.org. This article was originally by published on CDKN’s website and is shared with the author’s permission. Cover photo by Anton Bielousov/Wikimedia Commons (CC BY-SA 3.0): Mangroves in Los Haitises National Park (Dominican Republic). Can the Green Climate Fund help Guyana respond to climate change? The Government of Guyana is urging local organisations, like businesses, NGOs, and others, to join the fight against climate change. Climate change will have serious consequences for the people of Guyana, but cutting carbon emissions and protecting the country from extreme weather events is costly. Finance made available through the Green Climate Fund can help Guyana to prepare for climate change. A new programme being implemented by the Caribbean Community Climate Change Centre is raising awareness among Guyanese organisations about how to apply to the fund and respond to climate-related threats. In Guyana, preparing for the impacts of climate change is paramount. The low-lying coastal zone is home to 90% of the country’s population and particularly at risk. Climate change is causing sea levels to rise, and increasing the frequency of powerful storms and extreme rainfall. These can lead to destructive flooding; in 2005 alone, catastrophic floods cost the country 60% of its GDP or US$494.9 million. It has been estimated that in order to implement climate change adaptation measures, including infrastructural development works, Guyana will require an additional US$ 1.6 billion in the period to 2025. While the costs of taking action on climate change are high, the costs of doing nothing will be far higher. For example, with large coastal areas sitting between 0.5 and 1 meters below sea level, including Georgetown, sea level rise poses a serious threat to coastal populations, increasing the likelihood of coastal flooding. Substantial financial and human resources are necessary to build the resilience needed in Guyana. However, it is also imperative that an enabling environment is created to encourage adaptation and a reduction in greenhouse gas emissions. It is an established fact that every dollar spent on building resilience saves four dollars on avoided losses. Resilience building measures might include improved sea defences, reinforced mangrove forests, and improved agricultural practices. Emission reductions and resilience building provide returns on investments that any entrepreneur would want to pursue. Funding from the Green Climate Fund will support initiatives aimed at preparing Guyana for an uncertain climatic future. The Government of Guyana has already started to engage with the Green Climate Fund. Minister of State, Joseph Harmon has been appointed as the National Designated Authority (NDA) and the Office of Climate Change, Ministry of the Presidency serves as the Secretariat. Currently, Guyana is benefitting from a grant from the Fund to strengthen institutional capacity and prepare a country programme to guide future engagement with the Green Climate Fund according to clearly defined development goals. The Caribbean Community Climate Change Centre is implementing this new programme – ‘Capacity Building of the National Designated Authority (NDA) and Preparation of the Country Strategic Framework of the Cooperative Republic of Guyana (CRG)’ – which will help businesses, NGOs and government agencies access funding from the Fund. In addition, more funding proposals are being prepared for the agriculture, forestry and energy sectors to help strengthen these sectors’ response to climate change. Access to the funding requires organisations to go through a challenging accreditation process. This new programme provides guidance to help organisations decide if accreditation is right for them. In 2018, the Government plans to work closely with the private sector to enhance their capacity to access resources from the Fund. These resources will be instrumental in preparing the country’s long-term response to climate change, helping Guyana to prosper socially and economically. Cover photo by amanderson2/Flickr (CC BY 2.0). The Investor Group on Climate Change (IGCC) is today launching a new guide for investors on climate risk tools and resources and managing for resilience. The guide – Investing in Resilience: Tools and Frameworks for Managing Physical Risk – provides a snapshot of emerging tools and resources to help investors assess and manage physical climate risk, at both the portfolio and the asset level. It lays out some of the key concepts, issues and challenges associated with adaptation and provides a snapshot of emerging resources to help manage for resilience. Climate change is increasingly recognised as a financial risk for investors, requiring the same levels of governance, oversight and active management as any other dimension of material financial performance. These risks include both the financial costs and opportunities presented by transitioning to a net zero carbon economy, and the physical effects of climate change itself. “The impacts of climate change are already being felt. This is translating into increased costs for investors at the asset and the portfolio level. These costs are set to escalate as climate change accelerates”, said Emma Herd Chief Executive Officer, IGCC. “Financial regulators now expect financial institutions and regulated entities to have processes in place for managing climate change risks to their portfolio, this includes physical risk”. “Investors need new sophisticated tools and resources to actively identify, measure and manage physical risk. The good news is that these tools are emerging”. “Investing in Resilience is an important and practical addition to the wave of new tools emerging to help investors tackle physical risks for assets and increase the resilience of their portfolio”, said Herd. This guide is the latest in a series of resources that the Investor Group on Climate Change has developed in recent years to assess key climate risks across major industry sectors and identify means of investing in adaptation. It was initially developed in a workshop, co-hosted with NAB in June 2018, mapping the landscape of emerging tools and resources for managing climate resilience. It has been shaped and framed by investors and the finance community to accelerate the management of resilience across the Australian economy. Climate change is already having serious impacts for Guyana, 90% of the population live on the coastal plain, less than 1 meter above sea level. 75% of the country’s economic activity also takes place in this region. In 2005 Guyana suffered a catastrophic flood, which affected over a third of its population and cost over 60% of the country’s GDP. Tackling climate change is, therefore, an urgent necessity for Guyana, but cutting greenhouse gas emissions and adapting to climate impacts requires investment. To help with the cost of responding to climate change the Green Climate Fund (GCF) has been established under the UNFCCC. But what exactly is the GCF? who can access it? and how will it work in Guyana? To learn more we spoke with Janelle Christian, Head of Guyana’s Office of Climate Change. Cover photo by Guayana’s Department of Public Information. Climate financing by the world’s six largest multilateral development banks (MDBs) rose to a seven-year high of $35.2 billion in 2017. That equals an increase of nearly 30 per cent on the previous year, boosting projects that help developing countries cut emissions and address climate risks. The remaining 21 per cent, or $7.4 billion, of financing for emerging and developing nations was invested in climate adaptation projects that help economies deal with the effects of climate change such as unusual rainfall patterns, worsening droughts and extreme weather events. While the boost in climate finance is a welcome development, climate change adaptation is still severely underfunded. Adaptation and mitigation should not to be seen as competing interests, rather they are complementary strategies to a problem that needs addressing from several different angles. As such, the need to scale up finance is urgent for both, however, adaptation has a lot of catching up to do. According to UNEP, global estimates on the costs of adaptation suggest that between $280 billion and $500 billion need to be spent each year by 2050 in order to build climate resilience under higher emission scenarios. This massive finance gap is already noticeable in developing countries, many of which are on the frontlines of climate change. The mobilisation of financial resources for climate adaptation (and mitigation) is a very important signal of political will and commitment to respond to climate change and its associated impacts. Read the full press release about the joint report here and download the full document by clicking here. Cover photo by UN Women/Flickr (CC BY-NC-ND 2.0).